The details on this page were accurate when this post was last updated (see time-stamp). Prices and availability can and will change, given enough time. This website contains cookies for personalized ads and links to companies that may compensate this site when you click on their link. By continuing to use this website, you consent to the use of ads, affiliate links, and cookies. 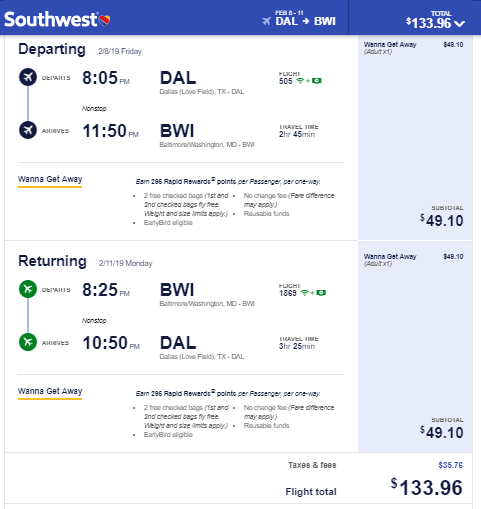 Southwest has round-trip flights from Dallas (DAL) Baltimore (BWI) for $134, NONSTOP. $67 each-way. Flights from October to February. Origin/Destination reversible. No Holidays. Note: You may find additional savings if you purchase your Flight+Hotel together as a package on Southwest Vacations. Before you commit, always compare the prices of the individual Flights and Hotel with other hotel booking sites like Hotels Combined. Example Dates: (Southwest) Nov 02 – Nov 04 / etc… / Feb 08 – Feb 11 / Other dates: Use the Fare Calendar on Southwest. There are more dates available than the ones we list here, experiment on your own. I was able to pull this fare up on Southwest. Screenshot taken when this post was initially created. See timestamps at the top of this post. If you plan on booking a hotel, use our travel coupon codes to save up to 15% to 20% off. Alternatively, you may be able to save the most money by booking your trip as a Flight + Hotel package on Priceline, Orbitz, or Travelocity. Note: OTAs such as Travelocity and Priceline allow free cancellation without penalty within 24-hours after you purchase. As deals sell-out or expire quickly, this policy will allow you to “lock-in” the cheap fare while you sort out a plan. Just keep in mind that after 24-hours you will not be able to cancel without the regular penalty. Book this fare on: Southwest, Priceline, BookingBuddy, Travelocity, Orbitz, Expedia, CheapTickets, Hotwire. Orbitz.com: LINK TO COUPON CODE: Save 15% to 20% Hotels. On Orbitz, scroll page to “Today’s Top Deals” for the coupon-code. CheapTickets.com: LINK TO COUPON CODE: Save 15% to 20% Hotels. Southwest Vacations: LINK TO COUPON CODES:Various coupons for Southwest Flight+Hotel packages. This site receives referral credit when you use links on our page to open our affiliate’s page. By using our affiliate links when you begin your airfare or hotel search, you are supporting this site. Thanks. [Bookable Deals] – list all the other great travel deals that are still alive and bookable. [Cheap DFW on Twitter] – get real time tweets on travel deals such as this one. [Subscribe to Cheap DFW] – get an e-mail newsletter and notification whenever a new flight deal is posted. 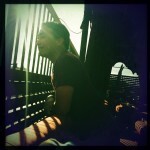 [Follow Cheap DFW on Facebook] – the best way to keep in touch with us, other than this blog. [Follow Cheap DFW on Google+] – If you are on Google+ please add us to your circle. Right now, we have virtually no following there. [Escape Houston] – Airfare and travel deals leaving from Houston (IAH / HOU). [Escape ATX] – Airfare and travel deals leaving from Austin (AUS) and San Antonio (SAT). [Escape Flights] – Airfare and travel deals departing from New York (EWR /JFK/ LGA), Los Angeles (LAX), and Chicago (ORD / MDW). Ren is the Chief Director of Nap Times at Escape Houston, Escape ATX, Cheap DFW, and Escape Flights. He really likes researching airfare and the travel industry, especially when it means getting a cheap flight to anywhere (he's not picky).